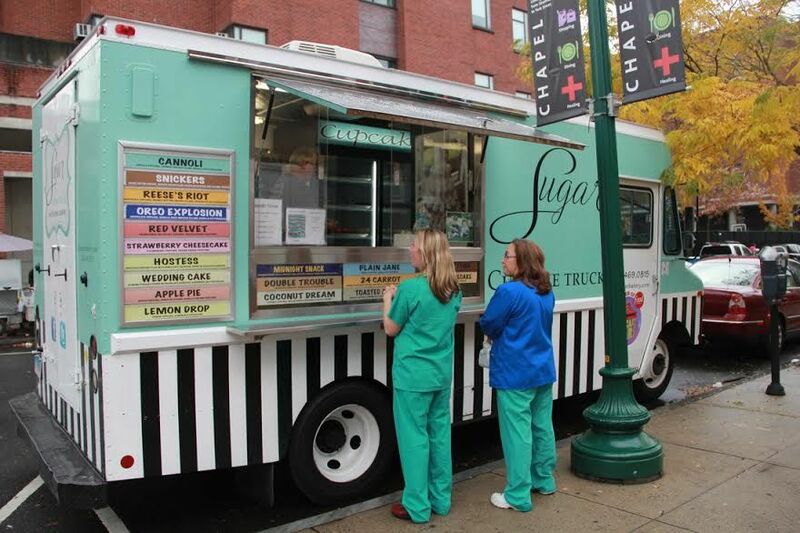 The Sugar Food Truck sells delicious cupcakes all over New Haven. If the food truck legislation passes, the truck may soon pay higher fees to vend downtown. The vibrant New Haven dining scene boasts famous pizza places, cozy cafes and, more recently, scores of food trucks. Food trucks and carts have become incredibly popular in the area, offering a wide range of foods from Thai to cupcakes. This new legislation would require vendors to pay additional fees for licenses in desirable areas, namely on Sachem Street, downtown, Long Wharf and Cedar Street. These fees would range from $1000 on Cedar and Sachem to $4250 on Long Wharf. However, the money from these fees would go back to the vending community, city officials said. The revenue generated would be used to hire a supervisor to handle vendor compliance. The city would also allocate these funds to address safety issues with additional police coverage, and to provide for cleaning in vendor areas, electricity on Long Wharf and trash removal during the warm months. The legislation, according to Fontana, would create a framework to handle gaps in New Haven’s existing enforcement regarding mobile vending. The current plan is for these updated regulations to go before the Board of Alders in October. The regulations would, if passed, go into effect on January 1. The legislation would increase the number of spaces in each popular area and give these profitable spots to vendors through a lottery. Vendors would also have the option to pay a higher fee to guarantee a preferable spot. These additional spots call into question the amount of competition among vendors in the same area. Ernesto Garcia affirmed this competition when he spoke for his truck, Ay! Arepa, located at the corner of York and Elm. He said that being near other trucks, especially those of a similar concept, hurts business. Response from vendors over this new legislation has been mixed. Garcia said that he would prefer not to pay the high fees such legislation proposes. Grate also opposes these extra fees, and believes the city should stop giving out permits instead of raising fees for established vendors. Despite some resistance from vendors because of higher fees and the introduction of more competition, Fontana remains optimistic that these measures will improve cleanliness and safety in vendor-heavy areas, and will be embraced by the vendor community. Food trucks are important to the Hopkins campus as well. The Four Flours cookie truck is a favorite at Back to School Bash, and Field Day also features a variety of restaurants on wheels. The food sold at these Hopkins events demonstrates why food trucks have become so popular in New Haven; the food is delicious, affordable and mobile.